This traditional British pie is thought to date back to the Second World War, but it was its inclusion on the menu at Cranks Vegetarian Restaurant in the 1960s that saw it grow in popularity. Popular in the seventies and eighties, homity pies were often seen as somewhat worthy – leathery, unappetising with a smug crust. But we thought this pie deserved a second look. This recipe is the grandson of those early pies and, we bashfully believe, a great improvement. We’ve cut down on the potatoes to make it less heavy and added some broccoli and other root veg – although you can vary these as you like. Celeriac and swede would also work well. A great veggie dish that can be enjoyed by all. To make the pastry, put the flours and butter into a food processor with a generous pinch of salt and pulse until the mixture resembles breadcrumbs. Add the egg and just enough cold water to bind the mixture together. Shape the dough into a ball, wrap it in cling film, and leave it to chill in the fridge while you make the filling. Bring a large saucepan of water to the boil. Add the potatoes, carrots and turnips and bring the water back to the boil. Cook for 4 minutes, then add the broccoli. Continue to cook until the vegetables are just done but still with a little bite to them – this will take about another 2 minutes. Drain and leave to cool. While the vegetables are cooking, melt the butter in a large frying pan. Add the onions with a pinch of salt and cook, stirring regularly, until the onions have softened and are lightly coloured. Add the garlic and continue to cook for another 2 minutes. Remove the pan from the heat and set aside to cool. Preheat the oven to 200°C/Fan 180°C/Gas 6. Put all the cooled vegetables into a large bowl. Add 100g of the cheese and the parsley, then mix thoroughly and set aside. Roll out the pastry and use it to line a 20cm cake tin or a deep pie dish. Spoon the filling over the pastry. Whisk the milk and mustard together until you have a thin paste, then stir this into the cream. Season with a little salt. Pour this mixture in a slow and steady stream over the filling so it soaks through the layers of vegetables. Sprinkle the remaining cheese on top. 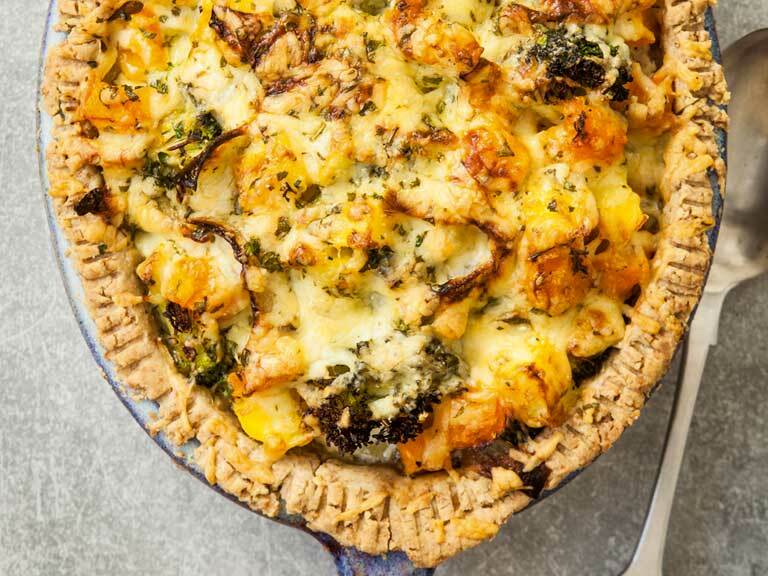 Bake the pie in the oven for 40–45 minutes until the pastry is crisp and lightly coloured and the cheese has melted and started to brown. Serve hot or at room temperature. 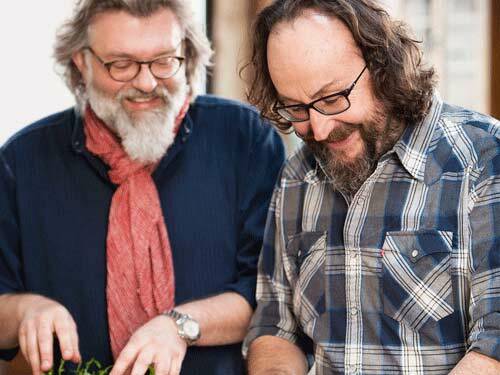 The Hairy Bikers are Dave Myers and Simon King. They are known for their television shows and recipe books mixing cookery and travel.